This document was originally published in The Drama: Its History, Literature and Influence on Civilization, vol. 14. ed. Alfred Bates. London: Historical Publishing Company, 1906. pp. 6-13. Between tragedy and comedy the transition is often but slightly marked. Thus Romeo and Juliet differs but little from most of Shakespeare's comedies in its ingredients and treatment--it is simply the direction of the whole that gives it the stamp of tragedy. Romeo and Juliet is a picture of love and its pitiable fate in a world whose atmosphere is too sharp for this, the tenderest blossom of human life. Two beings created for each other feel mutual love at the first glance; every consideration disappears before the irresistable impulse to live for one another; under circumstances hostile in the highest degree to their union, they unite themselves by a secret marriage, relying simply on the protection of an invisible power. Untoward incidents following in rapid succession, their heroic constancy is within a few days put to the proof, till, forcibly separated from each other, by a voluntary death they are united in the grave to meet again in another world. 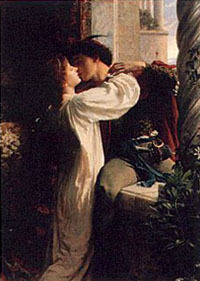 All this is to be found in the beautiful story which was told long before Shakespeare's day, and which, however simply told, will always excite a tender sympathy; but it was reserved for Shakespeare to join in one ideal picture purity of heart with warmth of imagination; sweetness and dignity of manners with passionate intensity of feeling. Under his handling, it has become a glorious song of praise on that inexpressible feeling which ennobles the soul and gives to it its highest sublimity, and which elevates even the senses into soul, while at the same time it is a melancholy elegy on its inherent and imparted frailty; it is at once the apotheosis and the obsequies of love. It appears here a heavenly spark that, as it descends to earth, is converted into the lightning flash, which almost in the same moment sets on fire and consumes the mortal being on whom it lights. All that is most intoxicating in the odor of a southern spring, all that is languishing in the song of the nightingale or voluptuous in the first opening of the rose, all alike breathe forth from this poem. But even more rapidly than the earliest blossoms of youth and beauty decay does it, from the first timidly bold declaration and modest return of love, hurry on to unlimited passion, to an irrevocable union; and then hasten, amid alternating storms of rapture and despair, to the fate of the two lovers, who yet appear enviable in their hard lot, for their love survives them, and by their death they have obtained an endless triumph over every separating power. The sweetest and the bitterest love and hatred, festive rejoicings and dark forebodings, tender embraces and sepulchral horrors, the fullness of life and self-annihilation, are here all brought close to each other; and yet these contrasts are so blended into a unity of impression, that the echo which the whole leaves in the mind resembles a single but endless sigh. With tears augmenting the fresh morning's dew. And walking all the night, making moan. Hath not seen the change of fourteen years. Prettiest babe that e'er I nursed. The preparation for their first interview goes forward; Benvolio has persuaded Romeo to go to the Capulet's feast. There is a slight pause in the action, but how gracefully it is filled up! Mercutio comes upon the scene, and is placed by the side of Romeo, to contrast with him, but also to harmonize. The poetry of Mercutio is that of fancy; the poetry of Romeo is that of imagination. The wit of Mercutio is the overflow of animal spirits, occasionally polluted, like a spring pure from the well-head, by the soil over which it passes; the wit of Romeo is somewhat artificial, and scarcely self-sustained--it is the unaccustomed play of the intellect when the passions "have come to the clenching point," but it is under control, it has no exuberance which, like the wit of Mercutio, admits the coloring of the sensual and the sarcastic. He had "a soul of lead"--he would be "a candle-holder and look on." But he has seen Juliet; and with what gorgeous images has that sight filled his imagination! As a rich jewel in an Ethiop's ear. We have now the poetry of passion bursting upon us in its purple light. Stands tiptoe on the misty mountains' tops. It cannot countervail the exchange of joy. She rejects her nurse--she resolves to deceive her parents. This scene brings out her character in its strongest and most beautiful relief. The final catastrophe comes. They have paid the penalty of the fierce hatreds that were engendered around them, and of their own precipitancy; but their misfortunes and their loves have healed the enmities of which they were the victims. The Courtship of Romeo and Juliet - An essay on the brief courtship of Shakespeare's star-crossed lovers. The History of Romeo and Juliet - A literary history of the play and its earliest editions. Lyricism and Character in Romeo and Juliet - An essay by G.G. Gervinus. Romeo and Juliet - An analysis of the play and characters. Romeo and Juliet: An Introduction - An introduction to the play. Romeo and Juliet: A Summary - A summary of the plot. Romeo and Juliet: The Sources of the Plot - An examination of the literary sources on which Shakespeare based the plot of his play. An Essay on Romeo and Juliet - General essay giving an overview of the play and its theme. Romeo and Juliet - The story of Shakespeare's play retold by Charles Lamb. Romeo and Juliet - The Nurse's monologue. Romeo and Juliet - Mercutio's monologue. Romeo and Juliet - Romeo's monologue. Romeo and Juliet - Juliet's monologue. Romeo and Juliet - The Friar's monologue. Romeo and Juliet: Poetic Rapture - An essay on the feminine and masculine characteristics of the play. Romeo and Juliet Quotes - Quotations from the play.